Lebanese Forces chief Samir Geagea has accused his rival Free Patriotic Movement leader Michel Aoun of deceiving the public and creating a media stir to win the backing of the rival Lebanese parties for the country’s top Christian post. 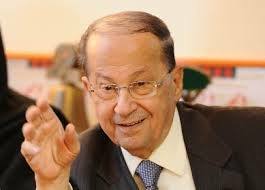 “Aoun hasn’t proposed a serious initiative. He made a media stir to pressure the Lebanese parties into electing him a president,” Geagea told al-Joumhouria daily in an interview published on Friday. He reiterated that parliament can’t make constitutional amendments amid a vacuum in the presidency. “There is a need for amendments to carry out the presidential polls properly but these changes can be proposed only after the elections,” Geagea said. Aoun suggested on Monday direct presidential elections and called for the adoption of an electoral draft-law that would allow each sect to elect its own representatives. He also accused the Change and Reform bloc leader of paralyzing all other initiatives made to resolve the deadlock that emerged after parliament failed to elect a new head of state. President Michel Suleiman left Baabda Palace on May 25, leaving the country’s top Christian post vacant. “Aoun is trying to deceive the public but the people know that his proposal is nothing but a media show,” the LF chief told al-Joumhouria. The majority of the March 8 alliance’s lawmakers, including members of Aoun’s bloc, have been boycotting parliamentary sessions aimed at electing a president under the excuse of lack of agreement on a compromise candidate. The FPM leader has said he would only announce his candidacy if there was consensus on him. But the March 14 alliance has kept its support for Geagea’s candidacy. The LF chief expected the security situation in Lebanon to be “generally stable” despite the latest suicide bombings that targeted the country. He lamented that the security forces were being burdened by Hizbullah’s presence in Syria. “The problem should be solved from its roots by stopping Hizbullah’s fighting in Syria,” Geagea said. The Shiite party has sent its members to the neighboring country to help President Bashar Assad’s troops that are fighting the rebels. But Sunni extremists, who have claimed to have carried out bombings in Lebanon, have promised more attacks as long as Hizbullah remains in Syria. The real point is, it shouldn’t be a ‘Christian Post’ OR a ‘Muslim Post’ …. It should be a ‘Lebanese Post’ if there’s a country called Lebanon. After which everyone would simply agree Aoun is an idiot who isn’t even running for election. Having both a President and a Prime Minister is costing the impoverished Lebanese SIX times the pay of any ‘Western’ Elected-by-the-people Leader. But then, what was Assad costing them? is the shia and the sunni ever made peace, they could tell both of these blowhards to go take a leap!